High Plains Samurai – A website for the High Plains Samurai Roleplaying Game. 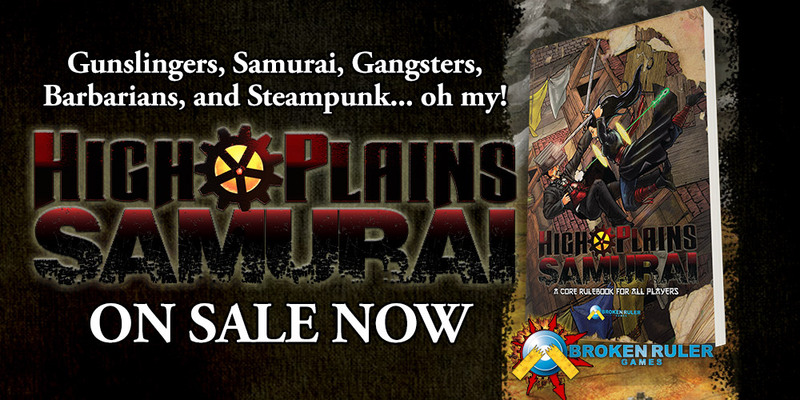 The High Plains Samurai Roleplaying Game is a story game about gunslingers, samurai, barbarians, and gangsters in a post-apocalyptic steampunk world where honour and the power from within your qi have been the only things keeping you alive. You shall create epic tales of anti-heroes rising from the ashes of the One Land’s barren shadow to become saviours, villains, or martyrs to their cause. This website is your portal to discover the unlimited possibilities of this game and the stories you can create with your friends. A collection of free tools, character sheets, and product links to explore and thrive in the One Land. Surviving the Wastes alone is a surefire way to doom yourself to a useless death. Along with your allies at your side, the High Plains Samurai Roleplaying Game provides rulebooks, character and scene notes, free downloads, and numerous other downloadable tools to help Writers and Directors alike master their descriptions and speed up gameplay. After you have read and meditated on the teachings found in the High Plains Samurai Roleplaying Game, your quest for knowledge is never complete. The Path of Enlightenment, will provide additional teachings from the creator of the game to expand on how the game works and how you can use this inside knowledge to improve your game as a Writer and Director. Tales From The One Land is a series of actual play recordings (APs) showcasing one-shot or serialized stories told with the High Plains Samurai Roleplaying Game. While each Tale presents a stand-alone rendition of events in the One Land, together they will create an anthology of adventures, exploits, and discoveries in this one version of the One Land.